When mages make mistakes, all sorts of sadistic, giggling horrors can be unleashed upon a defenceless town. Which is why Freebridge needs Tal Djandiss, the local impcatcher. It can be a dangerous business, dealing with imps on the loose. But when people start dying, Tal realises there is a bigger threat than a few rogue imps. And most high and mighty sorcerers won’t listen to a collector of vermin like him. Someone wants to silence him, though – a demon makes that very clear. And if Tal can’t work out what is going on, the whole of Freebridge is doomed. 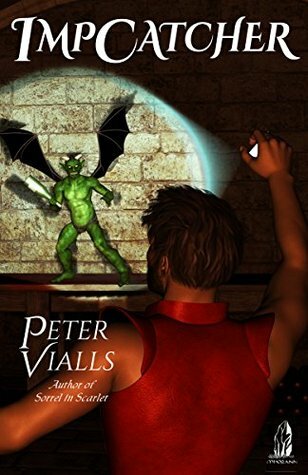 Peter Vialls is one of the more inventive storytellers I know, and Impcatcher is no exception. As the cover indicates, the setting of this novel could be found in any fantasy role-playing game. And the book definitely builds on this impression. The story is told in first person from Tal’s point of view, and Vialls does a good job of not making this boring. There were a few bits of the narrative that were repetitive or stating the obvious, but on the whole they didn’t detract from the forward movement of the story as a whole. Tal is an Impcatcher, a necessary task when misbehaving and careless mages abound. Which they do in Freebridge. Tal gets the occasional afternoon off, but one definitely got the impression that he is quite a busy man. What he doesn’t know when he comes across two dead street-children is that he’s about to embark on the biggest assignment of his life. The groundwork for, and the eventual realisation of, the climax of this book just blew me away. Fantastic, gripping stuff. And yes. Tal was JUST the person Freebridge needed for that assignment. An ordinary man, looked down on by those higher in the stratified society, called to do something extraordinary purely because only he realises the threat. An excellent book for those who love fantasy role-playing games, and also for those who just enjoy a good fantasy book involving mages and imps.